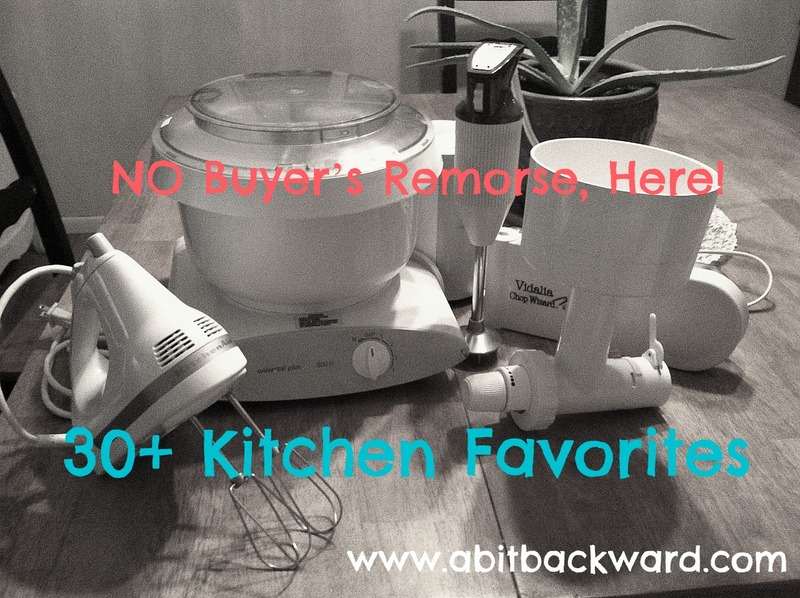 In accordance with your wishes, I am sharing my favorite purchases for the kitchen, today! Friends, there are affiliate links galore in this post, but let it be known not one of them was bought off of me. This is all stuff I already use and love every day. No regrets on any of these purchases! SnapWare Glass Ware – These have been our go-to wedding gift for some time. (We usually purchase these sets when they go on coupon at Costco!) They are the best for storing leftovers. The lids snap on providing great insulation for the food. No worries about plastic coming in contact with your food – especially food that needs to be re-heated. You can clearly see what is inside each container through the glass, and you can write on the lid with a dry erase marker to indicate the date the food was stored. They are dishwasher, microwave, oven, and freezer safe! Fliptite Storage Containers – I bought mine from Wal-mart. I got several of these sets and bought a few extras individual containers as well. They are great for storing grains, nuts, seeds, dried fruits etc. I love being able to see what is inside without having to see packaging. They seal beautifully as well, helping to protect the life of the food they contain. Gamma lids on 5-gallon buckets! 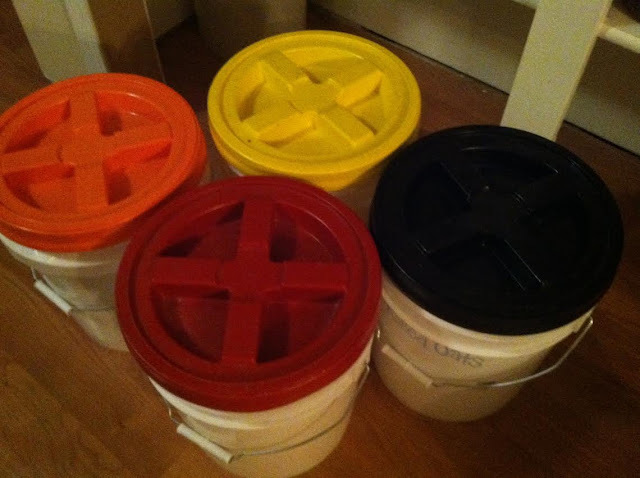 Gamma Lids - for 5-6 gallon buckets for bulk food storage. 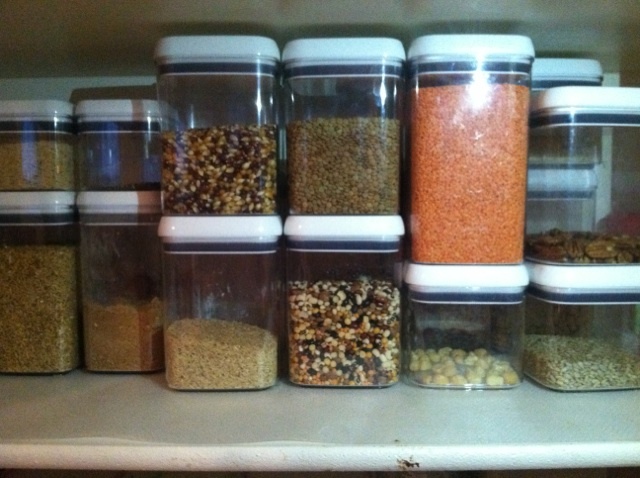 Easy open bulk food storage lids. I’ll never go back to the plastic wrench bucket opener again. Gamma lids for life! I have seen competitive pricing at Azure Standard, Emergency Essentials, Baytec Containers, and IFA Country Store, and WinCo. Just shop around. Generally speaking, any lid $7 or less is a great deal. Utilize different colors to differentiate what is inside each bucket. Blossom uCap, Re-usable Silicone lids for mason jars in clear and blue ones for drinking out of your mason jars with a straw - These are a great rust-free option for capping your canned goods after they have been opened, and they’re cute, too! Some of my spices on my Cop-co organizer shelf. InterDesign Refrigerator Organizers – I got a mixed pack from Costco. I particularly like these two: This one for storing eggs and this one for storing cheese. 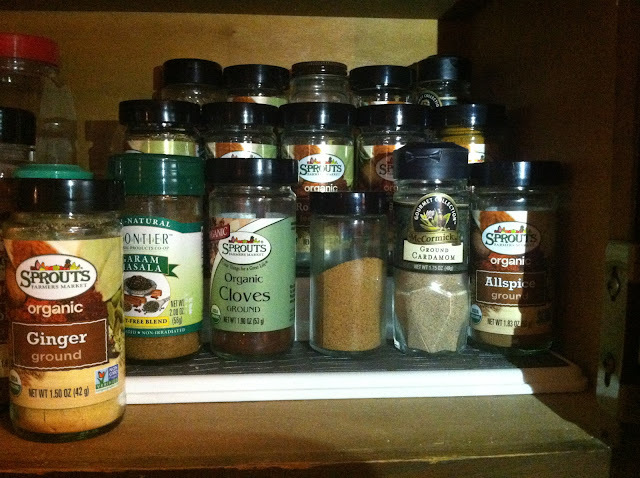 It is like adding extra small drawers to a fridge or cabinet space. They are great. 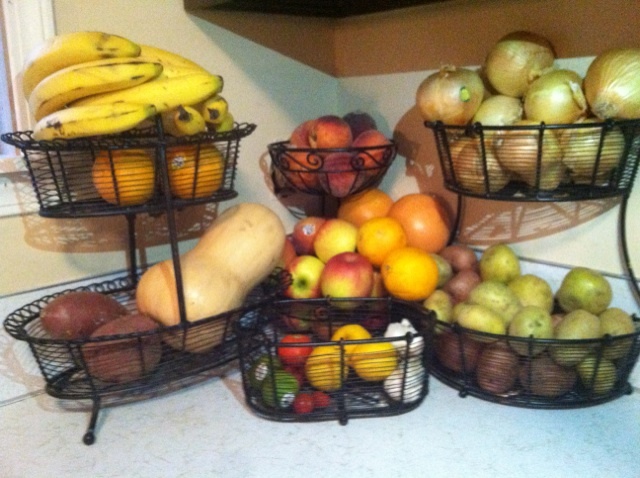 Wire Fruit Baskets – My fruit baskets were a gift from my mom around the time she came up for Jocelyn’s birth. She was tired of seeing my mammoth piles of produce scattered all over my counter. She bought mine at the HomeGoods store in Tucson. I’m sure you could find similar type baskets at your local HomeGoods, TJ Maxx or Ross-type store. Here are some adorable comparable baskets (albeit more expensive) on Amazon: like this one and this one and this one. 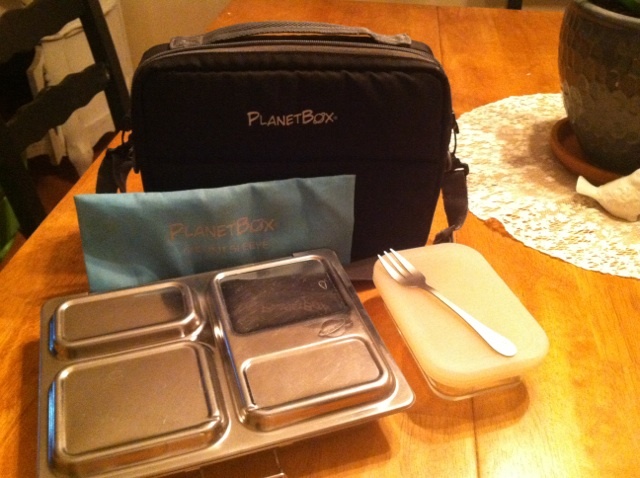 PlanetBox Launch Stainless Steel Lunch Box – This is just the best lunch box design of all time. I got this as a gift for Squire. He loves everything about this lunch box, except the fact that it brings attention to him every time he uses it, which he generally tries to avoid. (Everyone wants to know where he got it.) It was pricey for a lunch box, but worth every penny in my opinion. You can check out the PlanetBox website for more designs for every member of your family. KitchenAid hand mixer, Bosch Mixer, Bamix immersion blender, Vidalia Chop Wizard and my Family Grain Mill. Bosch Universal Plus Mixer – Oh, how I love my Bosch. It was a gift from a family member to us several years ago. You can not beat the Bosch for bread mixing. After 5 years of kneading my own bread dough regularly by hand, I’m not being melodramatic when I say that owning this changed my life in the kitchen for the better. The motor is powerful (and also loud, honestly. Perhaps the only downside, but power brings a strong voice!) The suctions on the Universal Plus model keep the machine from “walking” off the counter. The open top makes it easy to add flour to bread while it mixes so it is just the right consistency. Just. The. Best. Messerschmidt Family Grain Mill with Bosch adapter – This grain mill is the best of both worlds (hand and electric grinding) and for a really affordable price. (You can probably find a used one on eBay for cheaper, by the way! And you can find replacement parts at www.pleasanthillgrain.com) The adapter allows you to connect it to your Bosch for easy grain milling with the benefit of electric power. But if the power goes out, know that you can still grind grain by hand – this mill is easy enough to turn that even your three year old could do it! All-American 921 Pressure Cooker/Canner – This is a wonderful canning tool. Holds 18 pint size jars, or 7 quart jars. It allows you to can not only jams and fruits, but also meat, veggies and other low acid foods from the comfort of your own home. The quality is such that it’ll be passed down long after you're buried in the ground. Highly recommend. Not holding my breath, though! Salad Spinner, Juicer, Y-Peeler, Wooden Bowl, EZ Sprouter, and Highwin French Press. EZ Sprouter – Want to start sprouting your own grains or seeds? How about some Mung sprouts for your next Thai meal? Or some sprouts for your next sandwich or smoothie? Sprouting is an important element to the healthy eater’s diet and/or to the serious Prepper’s food storage. It allows you to create nutrient dense fresh greens from within the walls of your own home. This is a great all-around tool for that. Check out www.sproutpeople.org for more info. Vidalia Chop Wizard – This is one of Squire’s favorite tools in the kitchen. He uses it to cube up potatoes for hash browns, or fries with this. He also enjoys making apple hash with pork chops, and this gadget allows him to get even cubes much more quickly than he could get by hand cutting alone. OXO Salad Spinner – Salad spinners are the best way to prepare lettuce for salads. No sogginess. Just crisp, clean bites. Love the no-slip bottom that keeps it in place. Our kids love to “help” with salad-making because of this tool, especially. I have also heard it can make a great off-grid washing machine if necessary! Who-da-thunk. Berkey Water Filtration System with sight glass spigot – We use this water filter/purifier every single day. It purifies all the water we drink and cook with. It is the best bang for your buck for water purification in emergency preparedness situations as well. I enjoyed this video review. I purchased our system from www.bigberkeywaterfilters.com. The sight glass spigot is a very helpful addition. They also have Flouride filters available. Kitchenaid Y Peeler – Great peeler for veggies, or for slices of cheese. Easy to use, especially for the kids. Danish Dough Whisk – Helpful tool for sourdough cooking. I also like it for mixing up freshly ground multi-grain flours. 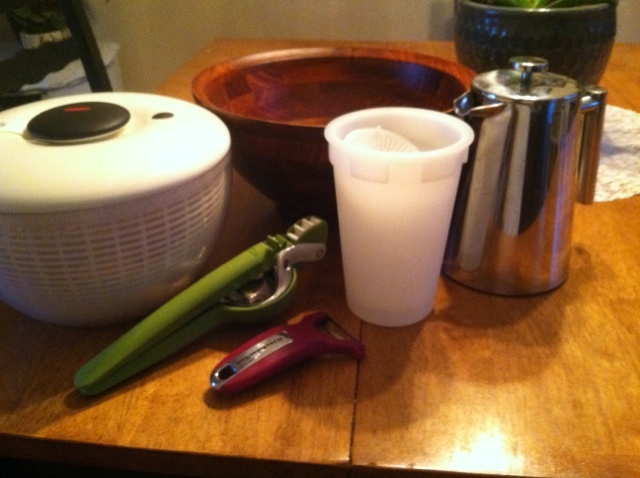 Chef’n Juicer – I have the lime juicer. It works great for all small citrus. Sturdy, reliable, seeds and juices the rinds really efficiently. Garlic Press – Forget peeling or mincing your fresh garlic. Just send the cloves through this press! OXO Silicone brush – Love this brush for egg washes and butter brushing on baked goods. Also helpful for spreading sauce on pizza crusts. Cleans up easy, dishwasher safe. Silicone baking Sheets – Don’t need to use aerosol sprays or any oils for baked products with these! They are a reusable alternative to expensive parchment paper. King Arthur Pizza Stone and Pizza Peel – My favorite pizza-making tools! Great for rustic breads, too. Although my pizza peel is all wood, the one on King Arthur’s site now looks even better! The secret to being able to transfer the dough to the stone is a little cornmeal sprinkled underneath the crust. 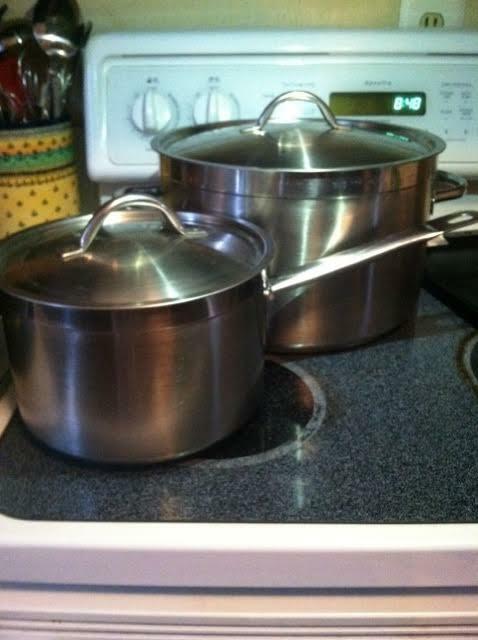 I had gone through two sets of non-stick pots in just 6 years. Seeing the flaking of the Teflon coating in our food for the second time was what motivated me to research cookware options. I wanted pieces that we could keep for the rest of our lives and without fear of toxic metal or chemicals leaching into our food. These two Vollrath pots help fill my tall order for lifetime quality cookware. The only thing missing from our stash is perhaps a 1-2 quart size sauce pan, but other than that, I haven’t missed my cookware sets with more quantity. These pots (and a vintage ceramic coated indoor dutch oven) meet our family’s cooking needs well. Check out www.webstaurant.com for competitive pricing. Vollrath Centurion 11-1/2 Qt. Sauce Pot 3203 – The volume of a stock pot, with less height to contend with. 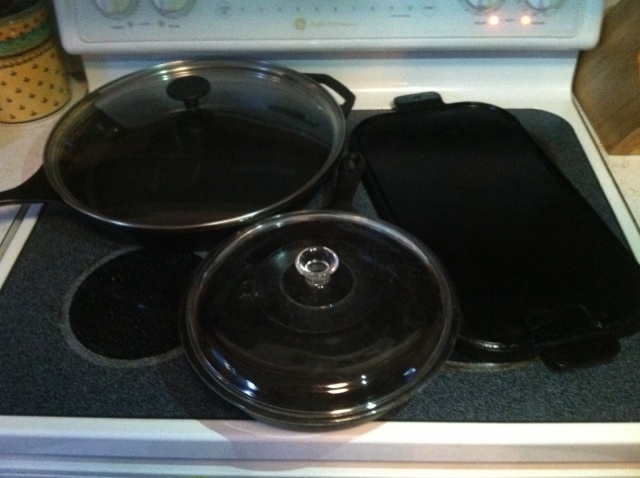 Cooks evenly, holds the heat with the lid on top so it is energy efficient as well. Cleans up easy, too. Tougher food bits are easily scrubbed off with a quick white vinegar soak. Vollrath Centurion 4-1/4 Qt. Sauce Pan 3704 - A great sauce pan. Looking forward to using it for a lifetime! A few cast-iron pieces in our collection. 15 inch L14SK3 Cast Iron Skillet, Lodge with this lid – I chose this skillet because it was the largest cast iron piece I could find that also had a glass lid to match. It has served our family and assisted me in cooking many large meals for friends as well. Cast Iron Utility Grill 1148, Wagner Ware Sydney, Vintage – Excellent vintage cast iron griddle on the stove top. Cast Iron Skillet 1058M, Wagner Ware Sydney, Vintage – Perfect skillet size for sides, sauces, eggs, and many other cooking needs. The vintage cast iron has a much smoother finish than Lodge pieces, making them a bit easier to clean and re-oil. Vintage have a smoother surface than Lodge cast iron, easier to clean. Already stood the test of time. If you need a lid for your cast iron, bring your piece to a thrift store and buy a glass lid that fits for just a couple dollars. Check out www.webstaurant.com for purchasing Lodge pieces. The prices are good there. Blue Ball Pint Jars, Heritage collection, set of 6 – These jars bring me joy! We mostly drink out of them as cups around here, but I also mix up salad dressing and store them in these jars sometimes, too. You might be able to pick up some legit vintage blue Ball jars if you hit up the right Estate sale or antique/thrift store near you. Their pricing is comparable or even a tad bit more expensive than the pricing on Amazon, here, generally speaking. Lipper Wooden Salad Bowl – As you can see from the photo above, my wooden bowl is not the exact same as the one I listed, here. The company that made my bowl is the same, though. Mine was purchased at TJ Maxx. I get compliments on my wooden bowl at every event I bring it to, filled with green or fruit salad, or rolls to share. It is my favorite bowl for entertaining company. 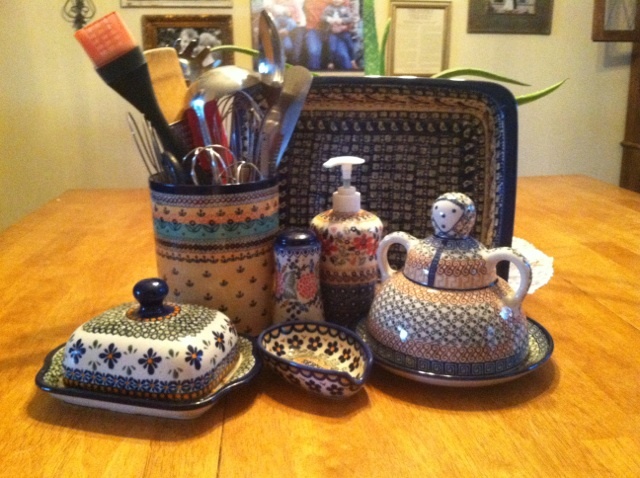 My Polish Pottery Collection. Love each piece! TJ Maxx – Find out what day shipments come in to get first dibs on the great finds. Costco Roadshows – You can look up what roadshows will be coming through your area and when. *Tip: I have a butter dish with a lid which I really enjoy. Butter crocks are also a great way to go. I have used my mom’s when I visit, and it is great! Aaaaand there you have it! A whole lot of kitchen favorites! Thanks for reading! Now it’s your turn! Please, tell me, what are some of your favorite Kitchen tools or accessories? I’d love to hear about them in the comments. Share with affiliate links if you like, too!